30 things I learned along the way! MYTIME MAIL! Today I am celebrating with a BIG giveaway! In honor of my 30 years, Im doing THREE random.org winners!!! So THREE people have a chance to win. The winner will be drawn Monday morning, since Im celebrating ALL weekend! Here are the GOODS!! SORRY for the yucky photos, it was to the point that if you wanted MYTIME MAIL- this was as good as it was getting. 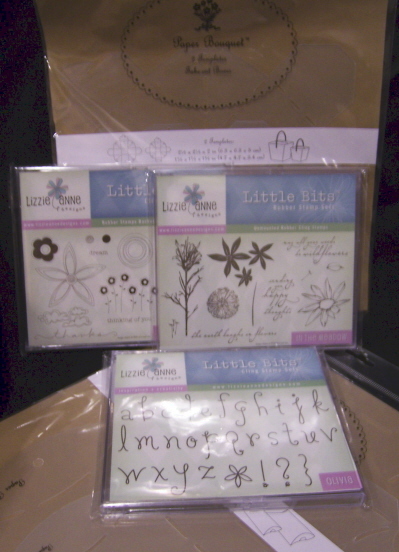 Package 1-3 Lizzie Anne Designs sets-Samantha Alphabet, Dreaming of Dots, and In the Meadow. There are also 2 Paper Bouquet templates. (2) template sizes in each-one is a take-out box, the other a pillow box! Package 3-Crafty Secrets Kitchen Classics and a Paper Salon mini tin with my favorite flower! A Tulip! Just reply to this post with any of the following-your very best birthday memory, a gift you would love to receive, one thing you have learned from life, or words you live by!! You pick! WOW! 30 years flew by fast! After 17, I don’t know what happened. Thank you for the b-day wishes and those who sent me cards! WOW! So touched by that! Oh and lets not forget the emails! I had over 600 emails! OMG!! That is a gift in itself. I am slowly reading each and every one. OK TODAY IS STILL SATURDAY SKETCH TIME!!! So here is the reminder! Remember this will enter you TWICE!! So you should all try it. I believe it was 2 years ago, I began the tradition of making MYSELF a birthday card! I found it to be so fun. This is the sentiment (from www.impressrubberstamps.com) that will be used on every card, from here on out! It is the first anniversary of my 29th birthday! LOL! 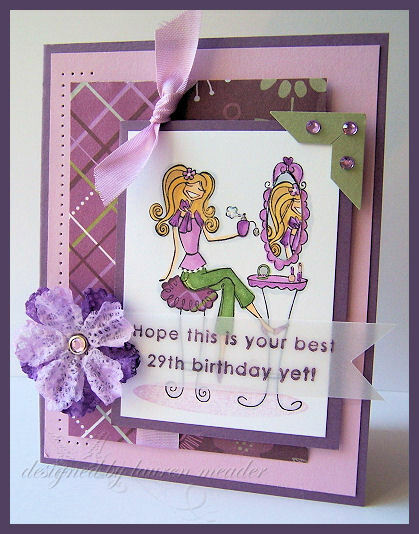 Sine I LOVE purple, Bella’s and bling, this card was super fun for me to put together. I also love vellum, and the tag thingy’s. Lets not forget Copic markers! 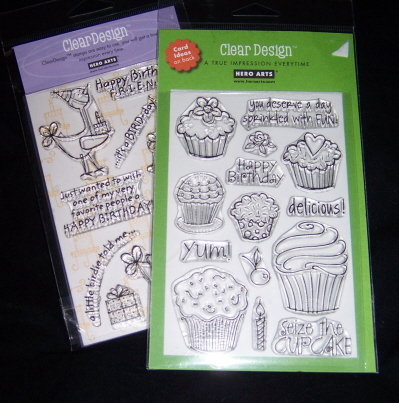 I am actually sending this to a fellow blogger, who is my “Birthday Twin”. Her name is Becky. HAPPY BIRTHDAY BECKY!! I’m all emotional and long winded today so get the fresh cup of coffee if you feel like reading! LOL! This part begins the REFLECTION section. This is Ohsoprettybella. Perfect. I am beginning to start this decade with self acceptance! What better Bella to use than this one? This is me! On the inside! LOL! Did you notice the reflection in the mirror? Pretty cool huh? I was so happy that the “idea” translated to paper. OK I am actually excited to be turning 30. My brain has clicked in, that it really isn’t the end of the world, but really a whole new start! I have so many amazing things taking place in this new decade of my life! My daughter is finishing her Cancer treatment! That is number ONE amazing to me. By far the best thing I could ever ask for. EVER! As mother’s we all just want our children to be HEALTHY & HAPPY. I know that is my number 1. Then it is to know God and have faith. I want them to grow up and find a fulfilling job, that they love, someone to share it with, and become people in the world who are kind, respectful, thoughtful and give a little something back to the world. I could not ask to be in a better place right now! I have the BEST husband in the world. He is my rock and my very best friend. He has been there for me every second, never, letting me fall. He treats me like we are still dating, and looks at me the same-kids later & all! I am getting to do something that I LOVE and find fulfilling, and think it’s safe to say I found my niche in life! 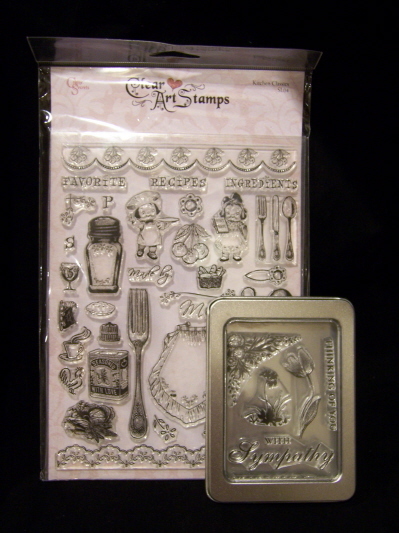 I cannot tell you what this crazy stamping life brings to mine! Then the ability to reach others doing so. I never would have thought I would be where I am today, and I have enjoyed that journey! I’m so excited to begin teaching these classes in this setting! When I look back on my 20’s, they were quite full. Some good, some awesome, but also some of the worst things I could have gone through! All amazing in the aspect that it lead me HERE! To a fabulous place, that I wouldn’t change one step for, because I would not be who I am today. I can’t tell you how each step affected me in phenomenal ways. Making me stronger, more independent. Unafraid to go for what I want. -finish college to become a nurse, got married at 20, at 21 had first born child with life long disabilities but an amazing blessing, becoming a single mom by 22 and getting divorced, eventually meeting my husband and moving forward in life, packing up and moving to a place where I know NO ONE, remodeling a home, having 2 more children-both healthy, getting re-married, getting into stamping, finding out someone you love has Cancer (and that its your baby!! ), pushing through that, someone I love beating cancer, then somehwere in the midst of all that, finding myself, sharing it all, and working to do what I love. WHEW! What a decade. I think I may even be glad to say good by to my 20’s! I think that some of what I did takes most a lifetime! LOL! CRAZY! So this is going to be a Decade of Different! A Decade of Fabulous! A time to enjoy life! I am happy to say I have absolutely NO REGRETS. Let’s hope I get through my next 30, and can say the same. 30 things I learned along the way-in no particular order. 1) FAITH! The single most important thing I could ever have. Without it I would not have gotten through some of the worst times in my life. Same goes for family & friends. 2) You NEVER want to talk to ANYONE who calls from an (800) number! TRUST ME! LOL! 3) Make time for yourself and the things/people you love. You never hear anyone say “I spent too much time with so and so”. Usually only regrets of not enough time. 4) Try to be positive. It can ALWAYS be worse, and when it is, then know it has to get better-right? 5) You miss 100% of the chances you DONT take. 6) NO! I am learning to say that word to things I dont really want to do, or just don’t have time to do. 7) Shopping really is therapeutic! For me anyway! LOL! 8) You will never love anything more than your own children! Who else in the world would you GLADLY give your life for? 9) Work to LIVE, not live to work. 10) Money cannot buy you happiness. Memories are something that will long outlast any fortune. 11) If it comes easy, it goes away easy! Things that are earned with hard work, will last much longer, and be more valued and appreciated, than those handed to us. 12) There is a reason that the older I get, the more I become like my mother! The older, the wiser! 13) That brings me to the understanding of “Youth is wasted on the young” While Im not “old” I am older, and I now GET IT!!! I wish at 20, I knew what I know now! 14) It is much CHEAPER to go to the dentist every 6 months, rather than wait a decade! I know what I am talking about. 15) Make sure you Pee before leaving the house too! You never know when you may ge stuck in traffic! LOL! 16) You really can have too much of a good thing. 17) Say what you mean, and mean what you say! Words are never forgotten and can hurt forever. 18) I hate sports! ALL of them, unless my child is involved. 19) Don’t wait till you have over 20 mice, to make your husband buy DECON! If ther is ONE there is a BIG problem-period! 20) If your husband takes you shopping for something (like a dog) he better be ready to buy it-THEN AND THERE!! 21) Everything has a reason and a purpose. You have the ability to make the most of very situation. 22) Take out does taste better! LOL! 23) When a house project gets started, there is a 2 year period from start to finish, anything sooner is a bonus! LOL! 25) To Do lists really do work! They are essential to my life. OCD isn’t all bad, it can actually come in handy. 26) In only ONE second you life can change forever. Don’t waste one minute. 27) Don’t put off for tomorrow what you can do today! No one is guaranteed tomorrow. 28) Live life to the fullest. 29) Twenty Nine-Once you leave it, its not the end of the world!! And speaking of the world, stamping can make a difference in the world! It can relieve stress, make someone’s day, capture a memory in an amazing way, and some of the best people do it! 30)THIRTY Is just the beginning of many great thing for me and my family! I am SO up for the journey. If you are still reading WOW! You must really like me! LOL! I can’t wait to finish reading my emails & your comments here! Best of luck!!! 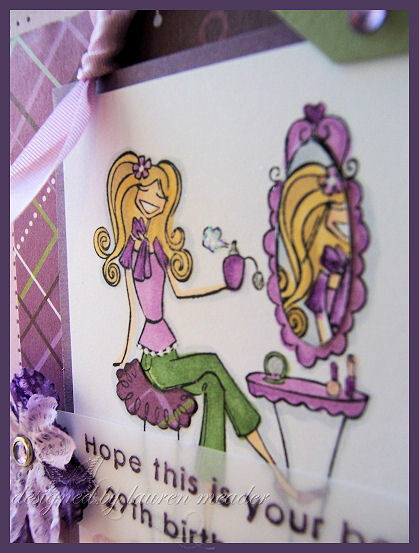 I am off to a fabulous day! Thank you for the support and well wishes! 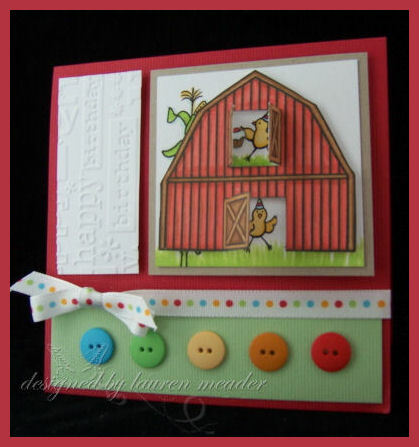 Since its my b-day, and I needed to post a sample with this new set from Pink Cat Studio, Party Farm Animals, I decided to save my favorite design with you today!! 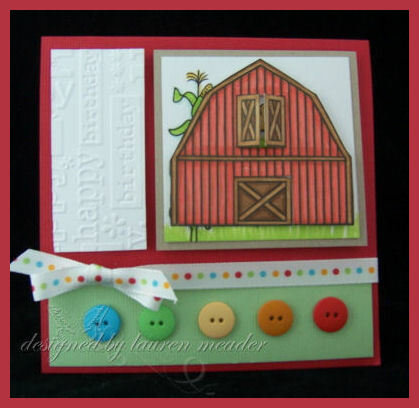 This barn is part of her new bkgd set. I immediately knew what I wanted to do! I colored and cut out the barn. I made it so the doors would OPEN! When you open them up………………..Look what is inside! Cute little chickies!! I so love these chicks! I was surprised at how fast this actually came together! I colored my edges first, then my barn. I quickly ran my brownish Copic down the red lines of the barn wood and it looked so “barn-ish”! LOL! I love the buttons along the bottom. So cute! Yet no over-done. Make sure you check the blog, and other DT samples. Just an amazing group. Have a fabulous day!! Im on the run.